Colorful ceramic disk beads made in Greece are surprisingly durable and make rich complements to your jewelry designs with their vast range of matte glazed and plated colors. A perfect alternative to traditional rondelles, these Greek ceramic beads come in 8mm and 13mm sizes and are sold in tonal color mixes, precious metal-plated versions, and fashion colors that suit vintage-inspired designs and accessories for the most current color trends. The thickness of the strong porcelain varies slightly for an organic crafted look, but averages a slim 2mm. 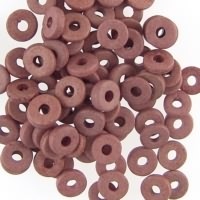 The matte color bead holes average 2.7mm, allow up to a 12 gauge wire. 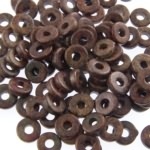 The metallic finish bead holes average 2.1mm, allow up to a 13-14 gauge wire. Size: 8mm. 25 beads per packet. Ceramic plated in fine silver. Bright and shiny, not antiqued. Size: 13mm. 12 beads per packet. Silver plated ceramic. Size: 8mm. 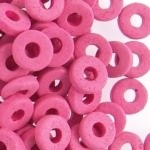 18 beads per packet. Gold plated ceramic. Antiqued. Size: 8mm. 25 beads per packet. Copper plated ceramic.